Would you call 311 if you spotted a raccoon or squirrel? Turkeys are the same thing, borough says. 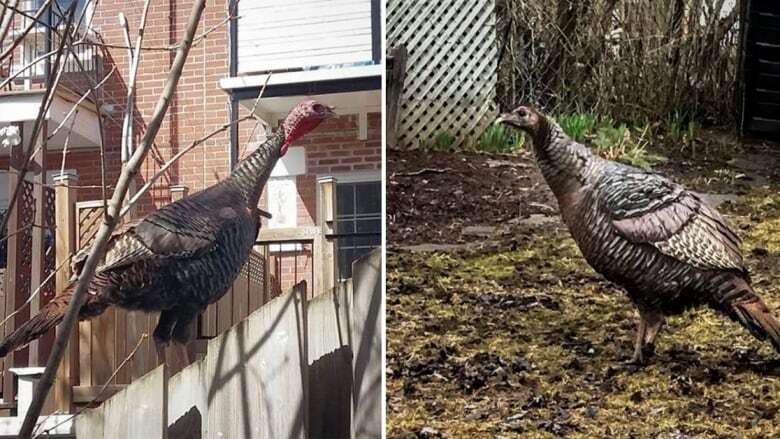 The borough of Rosemont—La Petite-Patrie is reassuring residents that the large birds that have been spotted roaming the streets in recent weeks don't pose a threat and don't require a call to 311. "If you cross paths with a turkey, continue on your way like you would for a raccoon or a squirrel," the borough advised in a recent Facebook post. Residents have been posting pictures of the birds hanging out in backyards and perching on fences for several weeks. Anyone who spots an injured bird is being advised to call the Montreal SPCA. While it might be a surprising sight in the city, wild turkeys are taking hold in Quebec. "Turkeys have been on the rise in Quebec since they were introduced in around 2000 and they're growing in numbers," said Barbara Frei, director of the McGill Bird Observatory. "They're quite shy birds when they're not out and about, so they can be hard to spot. So you may be surprised by how many there are in one location when they finally do come out of hiding." Frei said the birds can become aggressive if they are cornered or feel threatened, so it's best to leave them be. They also have complicated social lives so if they can't distinguish you from an outsider turkey, they may feel the need to show you who is in charge. "This is where the term pecking order comes from ...they establish these complex social dynamics by pecking on subordinates," Frei said. "Turkeys are not the smartest of birds. They have fairly small brains for their body size which is quite large — a male can be from 16 to 25 pounds." While turkeys are not a significant threat, residents should not approach or try to interact with them. "When they encounter a new individual they may not differentiate between turkey and human and then they'll say, 'Hey, there's somebody new here, I need to show them how tough I am' and that's when they'll begin to attack or at least intimidate you." Turkeys are largely vegetarian, but will eat insects they find. They're not great fliers and spend most of their time on the ground looking for food. They can make short flights and typically roost in trees.